Our paper titled ‘The effect of the most common gait perturbations on the compensatory limb’s ankle, knee, and hip moments during the first stepping response’ has been accepted for publication in Gait and Posture on 04/10/19. Our paper titled ‘Electrocortical activity changes in response to unpredictable trip perturbations induced by a split-belt treadmill’ has been accepted for publication in 41st Annual International Conference of the IEEE Engineering in Medicine and Biology Society on 04/10/19. Our research featured in UH's Fall 2018 Magazine. We are excited to welcome Dr. Junmo An who has research experiences in brain imaging, machine learning, and brain-machine interface. Dongyual's candidacy paper titled ‘Technology-assisted ankle rehabilitation improves balance and gait performance in stroke survivors: A randomized controlled study with 1-month follow-up’ has been accepted for publication in IEEE Transactions on Neural Systems and Rehabilitation Engineering on 10/28/18. Dr. Lee received the Provost’s Travel Fund to present research at the IEEE EMBC 2018. Our paper titled ‘Temporal gait measures associated with overground and treadmill walking in Rett syndrome’ has been accepted for publication in Journal of Child Neurology on 05/07/18. The American Parkinson Disease Association (APDA) highlighted our research in the APDA's Spring 2018 Newsletter. Our paper titled ‘A new smart balance rehabilitation system technology platform: Development and preliminary assessment of the Smarter Balance System for home-based balance rehabilitation for individuals with Parkinson’s disease’ has been accepted for publication in 40th Annual International Conference of the IEEE Engineering in Medicine and Biology Society on 04/07/18. Our paper titled ‘Usability and validation of the Smarter Balance System: An unsupervised dynamic balance exercises system for individuals with Parkinson’s disease’ has been accepted for publication in IEEE Transactions on Neural Systems and Rehabilitation Engineering on 01/30/18. 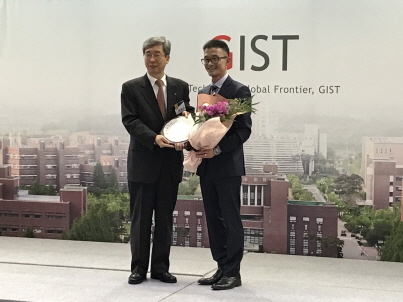 Dr. Lee received the most distinguished alumni award from Gwangju Institute of Science and Technology (GIST). Dongyual received the GenDepot poster award at KSEA-KABMS-KOES West Gulf Coast Conference on 11/4/2017. Gwangju Institute of Science and Technology (GIST) selected Dr. Lee to receive the most distinguished alumni award on 10/13/2017. Dr. Lee’s paper titled ‘The effects of coding schemes on vibrotactile biofeedback for dynamic balance training in Parkinson’s Disease and healthy elderly individuals’ has been accepted for publication in IEEE Transactions on Neural Systems and Rehabilitation Engineering on 10/02/17. Dr. Lee's renewal application for the APDA research grant program has been selected for funding on 06/26/17. Dongyual successfully passed the HHP doctoral qualifying examination on 06/16/17. Alberto received the HHP Pre Candidacy Project Research Award. Dr. Lee's CLASS research progress grant application has been awarded.